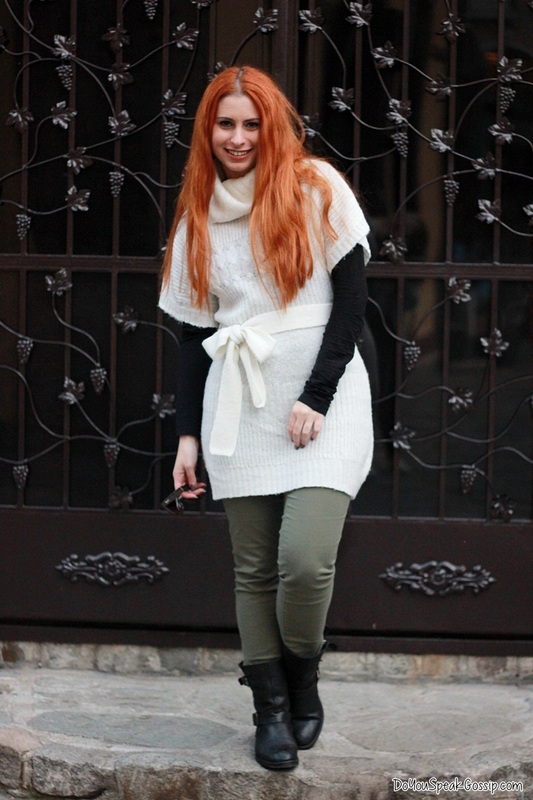 Casual B&W in the city | Outfits - Do You Speak Gossip?Do You Speak Gossip? Last week, the girls and I went to the opening of a fashion atelier here in Thessaloniki and since I wasn’t in the mood to be more dressed up, I decided to wear my striped sleeveless dress, my trusty satchel and a pair of flats. You rarely get to see me in flats because as I told you many times before this, I find them uncomfortable to walk in (I walk like a duck in them) and they give me the most terrible blisters of all my shoes. I risked it for this occasion, but after 2 hours, I was screaming for a pair of sandals or even better a pair of flip flops. Την περασμένη εβδομάδα πήγαμε με τα κορίτσια στα εγκαίνια ενός ατελιέ εδώ στη Θεσσαλονίκη και μιας και δεν είχα ιδιαίτερη διάθεση να ντυθώ καλύτερα (ξέρω, σπάνιο) αποφάσισα να φορέσω αυτό το αμάνικο φόρεμα με την αγαπημένη μου καλοκαιρινή τσάντα και ένα ζευγάρι χαμηλά παπούτσια. Με βλέπετε πολύ σπάνια με flat, γιατί όπως σας έχω ήδη πει πολλές φορές δεν τα βρίσκω καθόλου άνετα (περπατάω σαν πάπια όταν φοράω flat) και καταλήγω πάντα με φούσκες στα πόδια μου. Αυτήν τη φορά είπα να το ρισκάρω, αλλά μετά από 2 ώρες, πιστέψτε με, από μέσα μου ούρλιαζα για ένα ζευγάρι πέδιλα ή ακόμα καλύτερα σαγιονάρες. prepei na eisai i ekseresi ston kanona… Me ta flat eimai apla xaroumeni! xaxa poly spania tha valo psila! Hahaha Mallon, giati emena ooola mou ta flat me xtipane kai me gemizoun fouskales…Den ta antexw…Kai den me volevoun kai sto perpatima…. The dress is so cool! 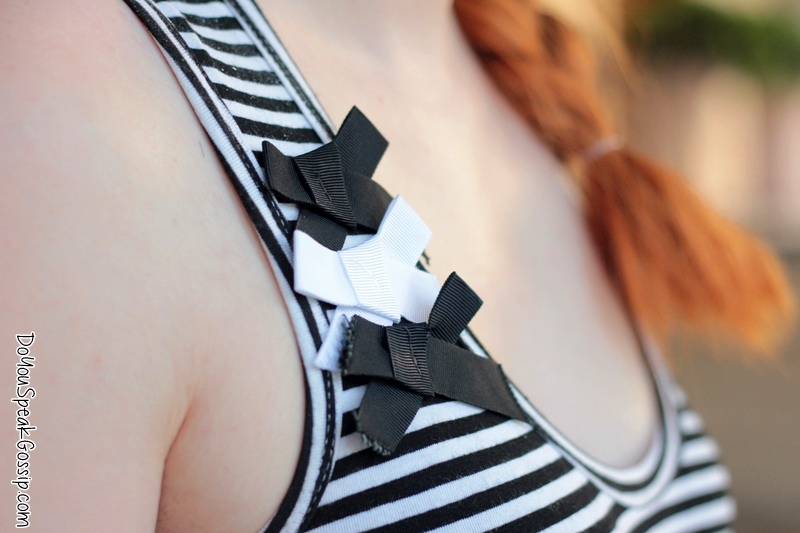 I like the combination of black and white and the bows! I also loved the satchel (you know I’m a big satchel fan – that’s what I wear when travelling and not only when, of course! They are so cute!) and I loved the shoes too! They look elegant and sweet, with the peep toe! I loved the pictures, the art wall, the streets, all looks so cool and interesting! And I like the hair too! You look very beautiful and perfect for a stroll! Makia! Thank you very much sweetie! 🙂 I love this satchel. I have it for years, and it’s perfect for everyday during summer. I’ve used it so much that its strap is no longer in a perfect condition. I hope the bag won’t get destroyed. LOvely Dress, lovely you, great photos!!! This is such a cute look, very Parisienne! And ouch, flats sound painful! I’m lucky I don’t have that problem, I don’t know what I’d do if I found flats to be unbearable! Aww thank you! Yes, unfortunately, flats are not for me. I’m much more comfortable in most of my heeled pairs of shoes. Τώρα τελευταία γίνονται πολλά fashion events στη Θεσσαλονικη! !Είστε πολύ τυχερές! !Το φόρεμά σου είναι τέλειο…αγαπώ τις ρίγες! !Λυπάμαι που δε σε βόλεψαν τα flat! !Και εγώ σε έχω συνηθίσει με τακούνια χαχαχα!!Φιλιά!! Den exw paraono, siga siga arxisoun na ksipnane ki edw pera sti Thessaloniki. Kairos itane giati eimaste poli pisw. Auto to forema einai agapimeno tis mamas mou kai to protimw idiaitera kathe Anoixi kai fthinopwro pou o kairos den einai poli zestos, kathws exei diplo ifasma sto katw meros kai mporei na ginei poli zesto to kalokairi. oh how cute do you look in the first photo? love your smile! and so funny that you can’t walk in flats, i have the opposite problem! i envy girls like you who can wear heels all the time, seriously! ps. love the pastel yellow nails too! that’s a gorgeous colour! Aww thank you very much! 🙂 It’s the smile of awkwardness when we’re taking photos in the middle of the road and people are watching. hehe I’m never comfortable in those situations. There are so many different types of heels. Definitely not all of them, are made for walking, and to be honest ALL my shoes hit me or give me blisters at some point, but for me it’s frustrating that the shoes that are supposed to be made for walking (like flats) hit me even more than my heeled pairs. So when I have to go downtown, or do some walking around, I have to think REALLY carefully about what to wear, because I have so very few pairs that are truly comfortable, and they’re usually winter boots, like biker ones. In summer, my feet get swollen from the heat, and I can’t walk comfortably in anything.